Editor in Chief Greg Tito says: My Inquisitor has horns. Yours may have pointy ears, or a big beard. My Inquisitor doesn't really believe in the Maker. Yours might and might believe they are touched by the divine. My Inquisitor is obsessed with mystical shards that seem to litter the landscape. Yours might be more interested in destroying dragons or in chasing down rogue mages. Everyone's story in Dragon Age: Inquisition is different, which has made it dominate the water-cooler discussion since it came out. Everyone who plays it can't help but talk about it. Building on the previous iterations in BioWare's flagship fantasy series, Inquisition seemed to be the first major RPG that took full advantage of the processing power of the new consoles to deliver a truly massive game. It's not a seamless open world, but the areas you can explore across Ferelden and Orlais are humongous. Simply getting from one point to another in these areas is an adventure unto itself. The characters of Dragon Age: Inquisition are so well-established that they start to feel like familiar friends. There are the party members. Varric the smart-talking dwarf returns and has a wonderfully complicated relationship with his interrogator Cassandra. Solas the elven mage intrigued by the Fade contrasts nicely with former Tevinter Dorian and the court mage Vivienne. Even the characters I didn't play with much at first, like Cole and Sera, were intriguing. The Iron Bull is just, well, great. But I especially enjoyed the supporting characters like Fiona the First Enchanter, Josephine the ambassador, and some of the returning folks (no spoilers here!). Each one of them was a fully realized person instead of cookie-cut attributes or regurgitated sterotypes. Hell, I even loved interacting with the dwarven scout Harding. She was a delight to speak to whenever I traveled to a new place - I really felt like she and I had a bond. Above all, Dragon Age: Inquisition portrayed its political scope so excellently. The Inquisition is a movement that has weight in the world, and that is shown most clearly through the war room mechanic and the massive table map. It looks like something out of Game of Thrones and I'm convinced that was intentional. You, as the leader of the Inquisition, are allowed to feel like you are controlling something important. What you do matters. The judgments you mete out have impact. You are in control of the fate of the world - many games state that on the back of the box but DA:I made sure it wasn't just a bullet point. 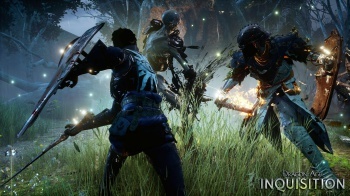 Dragon Age: Inquisition used the technical capabilities of the new consoles and the processing power of high-end PCs to push the boundaries of what is possible in a single game. I'm excited for what gamemakers create next with Dragon Age: Inquisition as inspiration. Next up, Best Movie of 2014. Click here!